19. 1860 Secession from the Union? 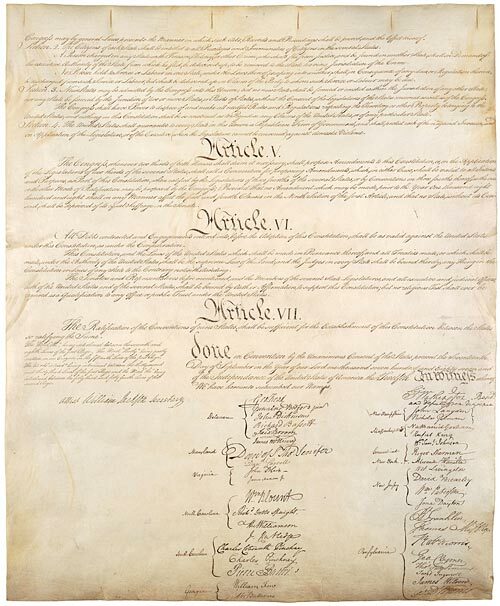 The U.S. Constitution sets forth the legal principles by which America's federal government operates. This image depicts a page of the now-faded original document. The government of the United States was initially based on the Articles of Confederation. However, the Articles of Confederation derived power from the states. This led to the very real problem of squabbling people, from different states, hindering the Articles-based central government from effectively operating. After the Revolutionary War, states began to have different views since there was no longer a common enemy to fight. The Articles of Confederation were too weak to adequately meet the needs of a unified America. To enable the United States to function more effectively, as an independent country, a new Constitution was needed. It was written in 1787; ratified in 1788; and became the law of the land in 1789. One main tenet of the Constitution of the United States was a limited government that would share power between the national and state governments. The Bill of Rights protects the individual freedoms of everyone. Many believe that one-third of the Bill of Rights came from the Magna Carta. America's Constitution is the highest law in the United States. Every state also has its own constitution that is the highest power of law for that state. The U.S Constitution, however, is the ultimate legal authority for the nation. 1. Having three separate branches of government ensure that no one branch of the government has too much power. a. The Legislative Branch is the Congress which makes the laws. There are two different Congressional bodies—the House of Representatives and the Senate. Both must work together to pass national laws. b. The Judicial Branch consists of three types of federal courts with the highest court of the land being the U.S. Supreme Court. The Supreme Court determines if the laws passed by the legislatures (both state and federal) are constitutional. Today there are are nine Supreme Court Justices. One of the nine Justices is the Chief Justice of the United States. c The Executive Branch is headed by the President, and his chief responsibility is to carry out (or enforce) the laws of the nation. The Vice-President, and the Secretaries of all the Administration's Departments, are also part of the Executive Branch. 1. Each of the three branches, of the U.S. federal government, can check the power of the other branch. Articles I, II, and III (of the U.S. Constitution) are the ways to keep the different branches of government in balance. 2. We can see how the concept of checks and balances works, in real life, by examining how a bill becomes a law. The bill must first be passed by both Houses, then the President may sign it into law or veto the bill. If the bill is vetoed, then Congress may override the veto provided it has a two-thirds vote to do so. The Supreme Court may decide whether a newly passed law is Constitutionally allowed if someone brings a case to the high court. 1. Articles I, II and III of the Constitution—together with the Bill of Rights—restrict the powers of the federal government. The Bill of Rights protects the individual against excessive power of the government. The Constitution recognizes that the authority of the federal government comes from "We The People." Voters hold the sovereign power but elect representatives to exercise that power for them. The President, Senators and House Representatives are responsible to the voters. This comes from the Constitution's Preamble together with Articles I and II. Most U.S. states have governments which mirror the federal government's structure. This includes the three separate-but-equal branches together with checks-and-balances. Vickie Burkins "The Basic Principles of the US Constitution" AwesomeStories.com. Jun 27, 2015. Apr 23, 2019.